Many people have been saying there’s been a little less movement regarding Magic finance during the past few weeks or months. Some people are saying there’s a slowdown. Others are saying it’s normal because the holidays are around the corner and players have less money to spend on Magic cards. Regardless, Magic continues to move full steam ahead. Magic Arena has been gaining a lot of traction lately which in turn is generating more interest in paper Magic. And that’s a good thing. 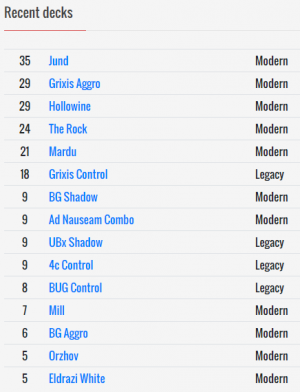 We also had an action-packed weekend with Grand Prix Milwaukee featuring Legacy, Modern, and Standard and SCG’s Las Vegas Standard Open with even more innovations. And Ultimate Masters spoilers are still rolling in. So even though the lists on MTG Stocks has seemed shorter than usual lately, this still a ton to dive into. Plus, this is a great time to buy into cards you need for tournaments or to fill out your collection as some people turn their attention to other purchases during the holidays. Cards that you should hold on to or pick up for tournaments if you need them before they rise in price. These cards are either seeing increased play in one or more formats, the supply is drying up, or they’re pretty far from the next reprint. Cards that you should consider selling or trading away. Their prices are pretty much at the ceiling owing to inflation from speculation, reprint inevitability in the near future, a lull in tournament play, or some combination of these. This recently rotated out of Standard, so this is a pretty good time to start picking these up. They won’t fall too much further because the card is a multi-format all-star. This card isn’t getting knocked out of Modern or Legacy by another option anytime soon. It’s just way too efficient. Plus, the printing of Assassin’s Trophy has increased demand for Fatal Push, leaving more people wanting to play Golgari and Jund decks. We’ll probably look back a year from now and see a nice upward trend on this promo. Card Kingdom has a small amount of these in stock at a $5. And TCGplayer has a few sellers with playsets at that price range too. This is starting to creep back up in price. And I’m not sure if we’ll see this in Ultimate Masters since it was just reprinted in Masters 25. This is probably one of the most efficient sideboard cards of all time. It does a very good job at trying to hose any deck that’s trying to abuse the graveyard, particularly Dredge which is still on the prowl. Take a look at Jonathan Zhang’s winning list from SCG Las Vegas. The reprinting of Life from the Loam in Ultimate Masters will also provide a bit of sorely needed supply to players looking for this card to play in Modern and Legacy. And don’t forget about Damping Sphere foils, which I mentioned in article #18. Continuing on Ultimate Masters, this just got reprinted as a common, which is going to make it legal in Pauper. Some people are still saying Pauper is dead. 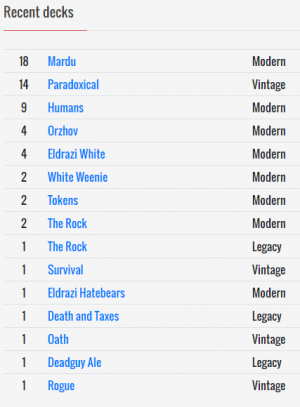 But Magic Online still has a healthy showing of League and Challenge tournaments, so I think it’s pretty far from dead. Plus, this is still a great way for new players to enjoy competitive tournament play at an affordable price, especially as a segway from Magic Arena. Take a look at SIKOSLOVAKE’s Izzet Delver deck for reference. This might be a nice deck for Fire // Ice when it becomes legal. Here’s another card that just rotated out of Standard and also has a decent showing in Modern plus scattered play in Legacy. And with the printing of Arclight Phoenix, this could start to see an uptick in play via Mardu decks. Take a look at Roope Metsas’s 17th place deck at Grand Prix Atlanta. As mentioned above, Fatal Push also shows up in this list. And don’t forget about foil Molten Rain, which I mentioned in article #17. I mentioned these as recent sells in article #15. And I made a small profit on these. But I still had a bunch left. I didn’t want to keep these any longer as I didn’t see the potential for these to spike in the near future since it hasn’t really taken off in Modern. It’s still possible that this could be broken, but that still remains to be seen. Thus, I decided to dump the rest of these at a loss in an effort to make up the difference somewhere else. I’m looking at a box of Ultimate Masters as a possibility to spend the store credit on. I’m still hearing mixed reviews regarding the expected value of a box, which is why I haven’t pulled the trigger yet. However, this is still a card to keep an eye on as the price continues to drop. And I think a target buy price for foils could be in the $5 range within the next few months. I mentioned Legion’s Landing in article #19 as a Fold. And I didn’t take advantage of that. Card Kingdom was buying these for $7.80 but now they’re their buylist price is only $6.50. Yet, I’m still thinking about selling them. Mist-Cloak Herald is another card I was going to sell. And the buylist price dropped from $0.09 to $0.07. You snooze; you lose. But I’ll also dump these if I sell the Legion’s Landings. Seven cents for a common is incredible! This was another card I mentioned in article #19. And I decided to get a playset since Arclight Phoenix decks are becoming more optimized and innovative in Modern. Plus, this is a decent sideboard option to combat Dredge like the aforementioned Rest in Peace. There aren’t too many of these left on TCGplayer, so if you want original foil versions of these, your window is probably closing pretty quickly. Otherwise, you’ll probably have to wait a while for a reprint if they don’t show up in Ultimate Masters. Stay up to the minute on what I’m looking at on a daily basis via the Hold ‘Em & Fold ‘Em – Public MTG Finance Spreadsheet. Don’t forget to bookmark it, because I update it on the fly. This way you can see what’s going on as the market moves and before articles about certain cards are published. Let me know what you think in the comments below. Agree? Disagree? Why? You can also connect with me on Twitter at @edwardeng. I’m also open to suggestions on how to make this series more valuable. Hit me up. This means that Fire/Ice’s potential home is possibly limited only to UR Delver decks, but it might well earn a spot there. You’re correct, David. Thanks for the note. I updated that section. Hey Edward just got 4 Rest in Peace in some Masters 25 I opened what price do you think it can get to? It might reach $10 but not 100% sure. Looks like it’s still on the rise, so that’s a good sign towards reaching $10. But if you need them, keep them since they’re highly playable and usually in multiples. If not, it looks like Card Kingdom is buying them for $5 right now. Thanks for taking the time to answer me! Yea I was thinking $8 – $10 and I’m going to hold. From experience I can tell you Masters 25 probably won’t be opened too much as the EV is sometimes hard to get. Anytime! Thanks for posting your question. Yeah, it doesn’t seem like Masters 25 was too popular. And Ultimate Masters will be the last Masters set for a while. Just be careful if you’re only in it to make a profit. It could easily get reprinted in Standard again or some supplemental set. If that’s the case, take the profit now or soon if there is some for you before that opportunity bursts. If you just need them to play with, then it’s pretty good that you got them now before they spike more. RIP maindeck in Modern. LOL.